Hemangioendothelioma, Epithelioid; Bone and Bones; Talus; Tibia. Epithelioid hemangioendothelioma (EHE) of the bone is extremely uncommon and consists of less than 1% of primary bone tumors. It is characterized by epithelioid endothelial cells and has variable biological behavior. EHE is more likely to occur between 20 and 30 years of age. Approximately half of EHE present with multifocal disease. Since the behavior of these tumors is intermediate, it is important to not misdiagnose EHE as an angiosarcoma. Here we describe the case of a 43-year-old male who presented with pain and swelling of the leg and ankle to Dr. Ram Manohar Lohia Hospital, India. Radiography and computed tomography of the ankle and leg were performed and suggested an expansile lytic lesion involving the distal tibia and talus bone. The lesion was excised and ankle arthrodesis performed. Histological evaluation of the lesion demonstrated the presence of EHE of the tibia and talus. Epithelioid hemangioendothelioma (EHE) is a rare low-grade malignant vascular tumor, which occur in skin, soft tissue, and visceral organs such as the lung and liver.1 EHE of the bone is extremely uncommon.2 The incidence of primary bone tumors has been reported to be less than 1%.3 Bones of the axial skeleton and long tubular bones are most frequently involved.4 In the long bones, it involves the metaphysis, diaphysis, and very rarely the epiphysis.3 EHE has a higher incidence of multicentricity.2 Here we report a case of multicentric EHE in an adult involving the talus and tibia bones. A 43-year-old man presented with pain and swelling in his right lower leg and ankle, which had lasted for four months. His history was remarkable for fracture of the right tibia following trivial trauma four months prior. He was treated conservatively for the fracture. In view of the persistent pain and swelling, the patient was referred to our center. At the time of presentation, the fracture had healed but the pain and swelling in the lower third of the leg and ankle was persistent. The pain was mild, intermittent, relieved by medications, and nonradiating. On examination, the skin of the leg and ankle was slightly discolored and there was diffuse swelling of the lower leg and ankle. The swelling was tender on palpation and there was an irregularity present on palpation of the tibia. Ankle movement was decreased and there was no neurovascular deficit. A radiograph showed united fracture of the tibia with an expansile lytic lesion of the tibia and talus bone [Figure 1a]. A computed tomography (CT) scan showed a lytic lesion involving the lower third of the tibia and talus bone [Figure 1b]. A provisional diagnosis of a giant cell tumor of the bone was considered. Preoperatively, there was an expansile tumor involving the tibia and talus [Figure 2]. 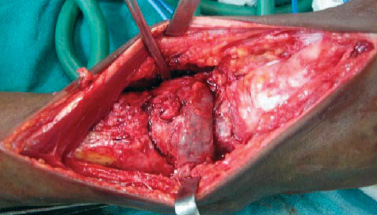 Excision of the tumor with ankle arthrodesis was performed and a fibular graft was placed in the defect area. Figure 1: (a) Anteroposterior and lateral radiographs and (b) computed tomography of the tibia and talus bones. Figure 2: Intraoperative photograph showing expanded tibia and talus bones due to tumor. Grossly, two necrotic bony tissue pieces measuring 5×4×2cm and 3.5×1.5×0.5cm forming a cavity filled with gray-brown necrotic friable material were identified. Histopathology showed an infiltrating tumor composed of nests, cords, and short strands of cells lining the vascular channels at places [Figure 3a]. The tumor cells were large and possessed eosinophilic cytoplasm and pleomorphic vesicular nuclei with prominent nucleoli. Few mitotic figures (0–10/hpf) were seen. Many of the tumor cells displayed small intracellular lumina seen as vacuoles or clear spaces, most of these contained red blood cells [Figure 3b and c]. A myxoid to hyalinized stroma was seen in the background as well as numerous dilated vessels and foci of calcification. The tumor cells were immunoreactive for vimentin, CD31, CD34, and factor VIII R:Ag [Figure 3d]. A diagnosis of low-grade EHE of the bone was made. A whole body skeletal survey was performed to exclude any other site of bone involvement. The patient was doing well at one-year follow-up. Figure 3: Hematoxylin and eosin staining of a photomicrograph showed (a) nests of tumor cells with microcalcifications, magnification=200×, and (b) tumor cells with intracytoplasmic vacoules containing red blood cells, magnification=400×. (c) Tumor cells showed moderate pleomorphism, vesicular nuclei and prominent nucleoli with occasional mitosis, magnification=400×. (d) The tumor cells were immunoreactive for factor VIII R:Ag. The differential diagnosis for EHE of the bone includes osteomyelitis and various tumors such as skeletal angiomatosis, Langerhans cell histiocytosis, myeloma, lymphoma, angiosarcoma, and metastasis. A definitive diagnosis based on radiological findings alone is often difficult.6 Histopathology remains the mainstay for the diagnosis. Early lesions show nests, cords, chains, and single-file arrays of small, uniform, epithelioid to slightly spindle-shaped cells with occasional intracytoplasmic lumina. The cells are present in dense, myxochondroid or myxohyaline matrix. Approximately, one-third of cases show anaplastic high-grade nuclear features, including frequent mitotic activity, necrosis, and sheet-like growth. These tumors are called high-grade or malignant EHE.2 A risk stratification model for EHE, based on a combination of cytology, mitotic rate, and size, has been proposed but has not yet been widely accepted. Primary vascular tumors of the bone are very rare. EHE of the bone is a rarely reported vascular tumor of the bone. Immunohistochemistry is a useful adjunct in diagnosing these tumors. The behavior of these tumors is intermediate; hence, it is important not to misdiagnose these as angiosarcomas. Although wide surgical excision is usually required, treatment plans should depend on extension and location of the disease. Weiss SW, Enzinger FM. Epithelioid hemangioendothelioma: a vascular tumor often mistaken for a carcinoma. Cancer 1982 Sep;50(5):970-981. Kleer CG, Unni KK, McLeod RA. Epithelioid hemangioendothelioma of bone. Am J Surg Pathol 1996 Nov;20(11):1301-1311. Unni KK. Hemangioendothelioma (hemangiosarcoma) and hemangiopericytoma. In: Dahlin‘s bone tumors: general aspect and data of 11,087 cases. 5th ed. Philadelphia, Pa Lippincoott, Wiliams & Wilkins; 1996. p. 317-331. 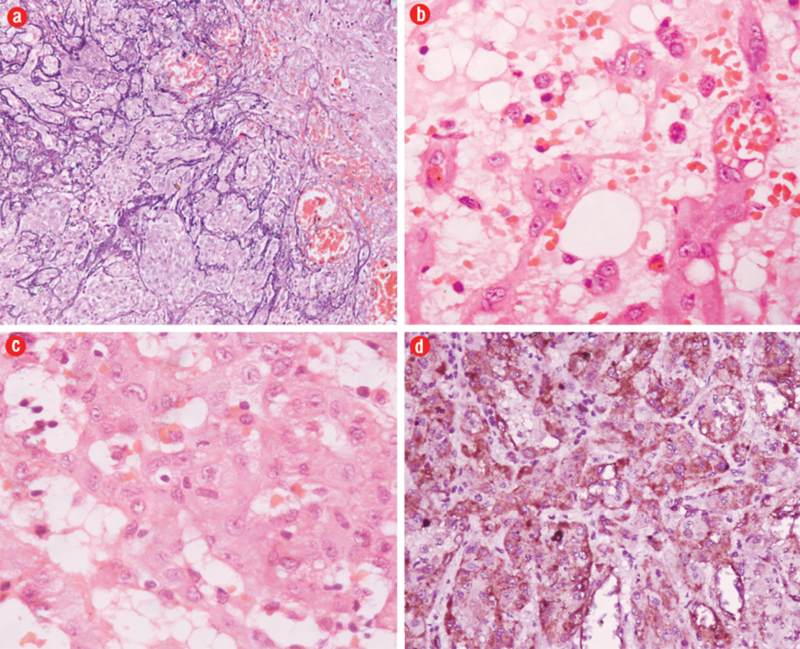 Weiss SW, Goldblum JR. Enzinger and Weiss’s Soft Tissue Tumors. 5th ed. Mosby Elesevier; 2008. P. 565-579. Errani C, Vanel D, Gambarotti M, Alberghini M, Picci P, Faldini C. Vascular bone tumors: a proposal of a classification based on clinicopathological, radiographic and genetic features. Skeletal Radiol 2012 Dec;41(12):1495-1507. Larochelle O, Périgny M, Lagacé R, Dion N, Giguère C. Best cases from the AFIP: epithelioid hemangioendothelioma of bone. Radiographics 2006 Jan-Feb;26(1):265-270. Hart J, Mandavilli S. Epithelioid angiosarcoma: a brief diagnostic review and differential diagnosis. Arch Pathol Lab Med 2011 Feb;135(2):268-272. Weissferdt A, Moran CA. Epithelioid hemangioendothelioma of the bone: a review and update. Adv Anat Pathol 2014 Jul;21(4):254-259. Evans HL, Raymond AK, Ayala AG. Vascular tumors of bone: A study of 17 cases other than ordinary hemangioma, with an evaluation of the relationship of hemangioendothelioma of bone to epithelioid hemangioma, epithelioid hemangioendothelioma, and high-grade angiosarcoma. Hum Pathol 2003 Jul;34(7):680-689. Gill R, O’Donnell RJ, Horvai A. Utility of immunohistochemistry for endothelial markers in distinguishing epithelioid hemangioendothelioma from carcinoma metastatic to bone. Arch Pathol Lab Med 2009 Jun;133(6):967-972. Fletcher CD, Unni KK, Meterns F. World Health Organization Classification of Tumours: Pathology and Genetics of Tumours of Soft Tissue and Bone. IARC Press. Lyon; 2002. Angelini A, Mavrogenis AF, Gambarotti M, Merlino B, Picci P, Ruggieri P. Surgical treatment and results of 62 patients with epithelioid hemangioendothelioma of bone. J Surg Oncol 2014 Jun;109(8):791-797.